Canada Goose Hunting Tips and Strategies That Work! Canadian geese are large birds that need regular food. They will usually stop and rest in their migrations near areas that both food and clean water is available. Goose hunting will always be best close to larger bodies of fresh water. Geese will not stay in swampy or sludge filled water; instead, they will travel further without stopping for food to find good water. Canada geese will usually always fly or be found in large groups, but occasionally the breeding pairs will split off. In the migration times, the most abundant groups will be seen, often flying in flocks of thousands. Goose hunting in Canada can be made challenging at this time due to the mixture of other waterfowl that may be present, so always be careful to know what you are shooting at and avoid shooting into large flocks of mixed birds. One of the best goose hunting tips can be to capitalize on the geese returning to the same spots to feed, especially in three to four-day cycles. Usually, they will feed one area until all the grain, or cereal crop is gone before moving again. As they are hunted they will become more leery of decoy placements, calls, and even blinds. Consider pursuing from different locations and leaving one or two area undisturbed until later in the hunt in one particular area. This will make sure the Canada geese will feel safe in these areas and will often use them as a default location later in their stay. Use calls judiciously. Canada goose hunting guides are experts at knowing how and when to use calls. If you use the incorrect call, you are likely to drive off the geese, rather than bring them in. There are different calls for feeding, returning to the water, and for alarm or distress. Scout the area in advance of Canada goose hunting. Look for natural areas that the geese will land to feed, return for the evening, and for signs that they have been present. A large flock of Canada’s will leave debris and waste behind both on the ground and on the water. In addition, talk to other hunters that are familiar with the area. 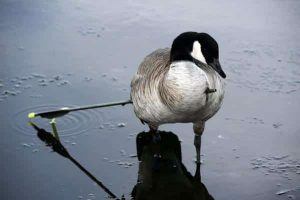 The weather will also play an essential role as geese are likely to stay close to safe, large bodies of water in cloudy or overcast weather while they will fly farther away on clear, warmer days.